﻿ Have you heard about Street Paws? Have you heard about Street Paws? Have you ever wondered where a homeless person would turn to if their furry companion were to become ill? You may or may not be familiar with Alison Hickman, personal assistant to the mortgage advisors at our partner company Mortgage Solutions of Wakefield – but did you know Alison is a woman of many talents? Alongside her ‘day job’ Alison is also a registered veterinary nurse, and through her connections in the veterinary profession she came to know about Street Paws, and now works as a private volunteer together with the Trustees of the charity and the veterinary professionals. Street Paws is a charity with over 130 volunteers aiming to help animals belonging to the homeless to live a happy life in good health. Michelle Southern set up Street Paws in April 2016 and now works for the charity full time. What do Street Paws do? 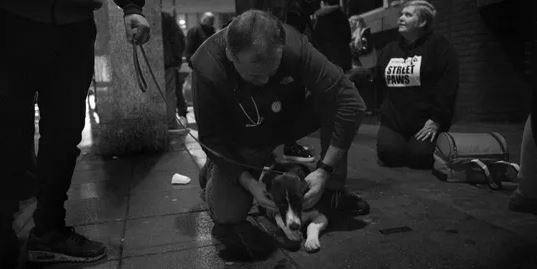 By providing free of charge veterinary care to animals owned by the homeless, vulnerably housed, and other vulnerable groups affected by poverty, the team at Street Paws have made a huge difference to the lives of animals across 14 cities in the North of England. The regular outreach meetings provide a safe, non judgemental environment for owners to bring their furry friends for free and non judgemental veterinary attention. “When you are at your lowest point, whatever the reasons for it happening, and you find yourself homeless, vulnerably housed or similar, a companion pet brings comfort, warmth, security, can make you laugh on the most awful of days and nights and they are something to focus on and keep yourself straight for. You trust your dog, you love your cat, you hold that rat or ferret close to your body. You won’t leave your companion. Your companion won’t leave you. Your companion never judges you. Ever. The Wakefield outreach meeting takes place on the first Tuesday of every month from 18:30-20:30pm. Please visit the Street Paws website to find out how you can help this cause.